Over the course of the past four episodes, Leonard Starr has laid the groundwork for a climactic finale. He more or less succeeds here in Part Five, tying up loose ends in smart ways and giving the good guys and the bad guys everything they deserve. That’s not to say it should be free from criticism—some plot points could have been better set up in prior parts, and the animation doesn’t reach the same heights as the story—but it is a satisfying and high-energy conclusion. The episode begins as the ThunderCats battle their way toward Fire Rock Mountain. Approaching by land, Panthro in the ThunderTank faces Monkian in the Fistpounder; and by sea, the Kittens tag out Snarf and Turmagar in waylaying the Berserkers. This is Starr’s most clever and delightful turn in the story, as the two storylines unexpectedly converge! Just when WilyKit and WilyKat have had it, the Fistpounder comes careening off a cliff directly onto the deck of the Berserker’s ship, sinking it. It’s worth the look on Hammerhand’s face alone. 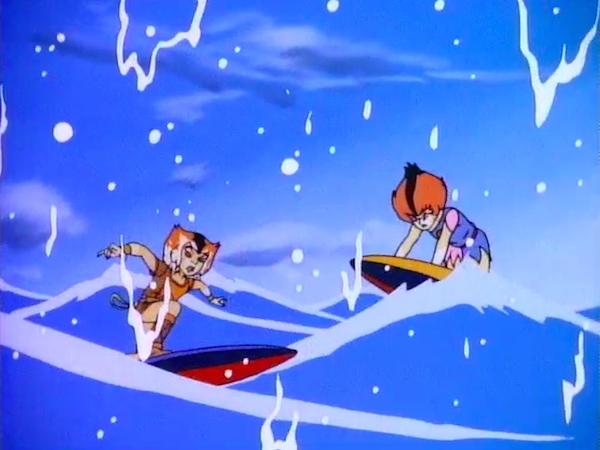 Tygra and Cheetara, meanwhile, are approaching Fire Rock Mountain by air, and their run-in with Captain Shiner (his final appearance in the series) is full of great moments. 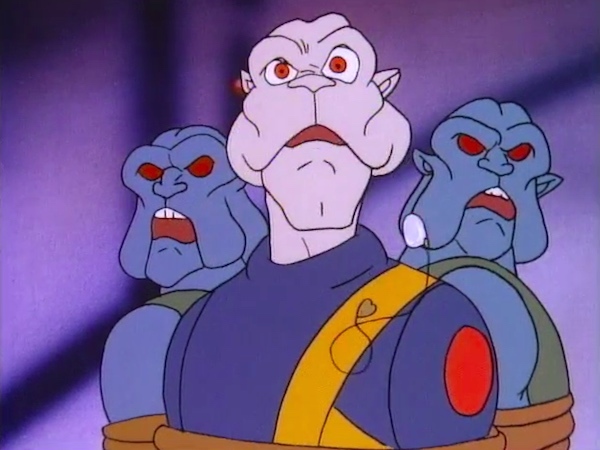 The whole sequence is about Shiner and his crew getting their comeuppance for their role in imprisoning Lynx-O, Bengali, and Pumyra; and it’s a crime that the ThunderCats do not take lightly. Cheetara’s shadow passing over the chains that bound the Thunderians is a brief moment, but it’s effective in reminding us of what took place here. It is therefore particularly karmic when those same chains are used to bind Shiner’s crew. Shiner himself also… shines. He’s most unimpressed with the ThunderClaw and HoverCat, barely paying attention as his crew tries to track them down. In an omitted line of dialogue, he even suggests that the ThunderCats probably fled, intimidated by the Vertus and her space scanners: “ThunderCats aren’t stupid.” Is Tygra and Cheetara’s punishment for the crew of the Vertus—rocketing them into deep space at full throttle—a bit harsh? Probably. But if anyone can wriggle his way out of a bind like that, it’s Shiner. Farewell, Captain! 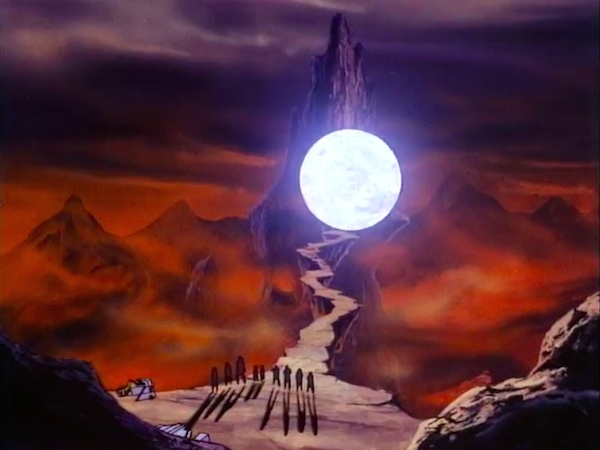 Once everyone is assembled at Fire Rock Mountain, Mumm-Ra banishes Hachiman back to his own time. It’s odd that Hachiman is still there, since he offered to venture into the prison alone to rescue the Thunderians—a brilliant plan that Starr seems to forget after proposing it. 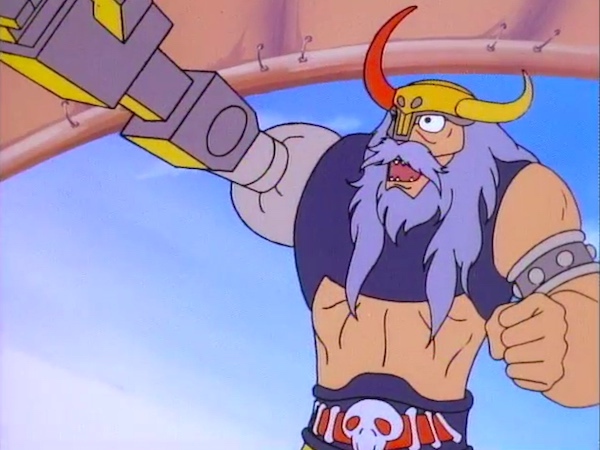 At this point, the story takes its final turn, as Jaga appears to Lion-O to introduce the deus ex machina known as the Star of Thundera: the greatest power in the Universe, which has never been mentioned before and will never be mentioned again. Starr would have done better to establish a reason for Mumm-Ra’s lack of interest in the Star until this point. The whole thing, from the Black Planet to the Star’s thundranium-quashing power to the locket Jaga uses to encapsulate it, suggests a wider, unspoken mythology that remains unexplored hereafter, and feels vaguely psychedelic in its randomness. 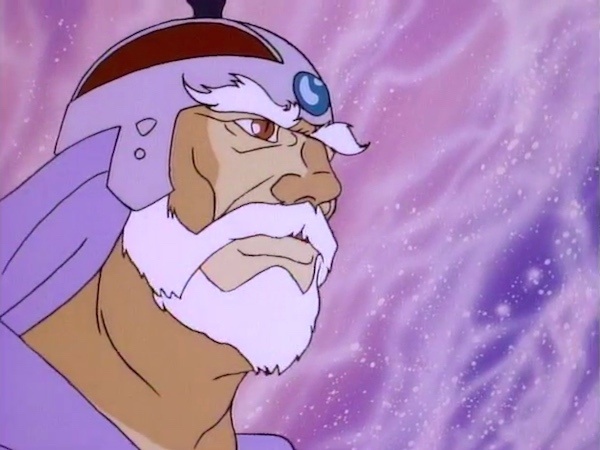 It’s important to note that, after all their troubles and despite Mumm-Ra’s best laid plans, the Thunderians do manage to escape on their own. By the time they do, though, Mumm-Ra has lost interest in his previous plan; he’s now completely fixated on the Star of Thundera. “Keep your sword,” he says in the script. 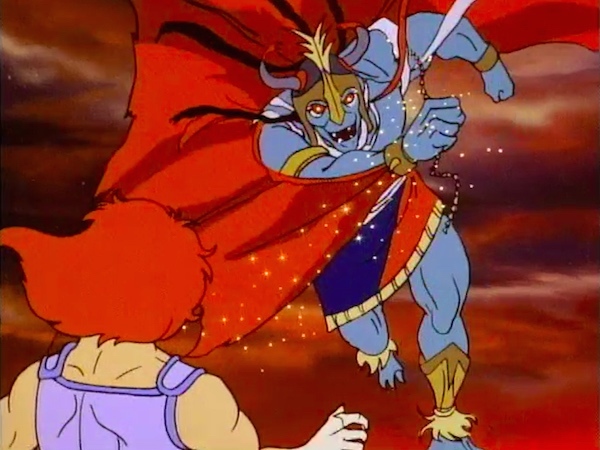 “The Star of Thundera is mine!” As will befall him later in “The Heritage” and “The Book of Omens”, Mumm-Ra’s greed and megalomania get the best of him here. He ignores Jaga’s warning and opens the talisman, releasing the Star’s energy and setting off a chain reaction of quakes and eruptions that destroy Fire Rock Mountain and bury him alive. The animation of the crumbling prison is well done, as are the trippy visual effects used to simulate the starfire and molten thundranium. The animators do include a handful of other nice details throughout: water cascading over the camera lens as the Berserkers’ bombard the ThunderKittens, Shiner’s monocle falling from his eye in shock, Mumm-Ra’s infinite snake insignia shown briefly on the prison gate, and the use of Fire Rock Mountain as a backdrop for Mumm-Ra’s transformation. 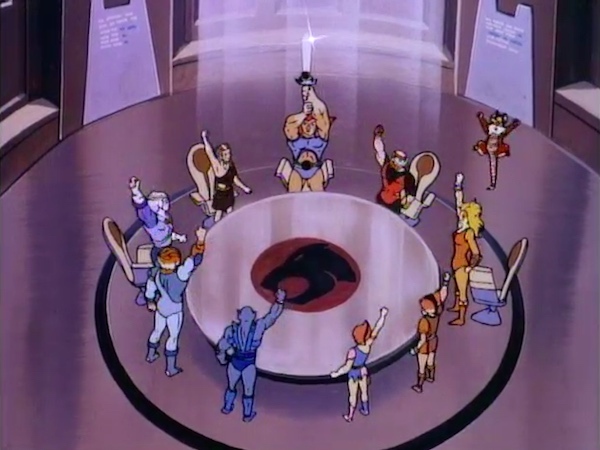 The onscreen countdown during Tygra and Cheetara’s egress from the Vertus is highly unusual—no equivalent springs to mind from any other episode. It’s also distracting, since it’s only ten seconds and time is clearly being protracted through editing. Then there are the mistakes. When Tygra alerts Cheetara to the Vertus at 10 o’clock high, she turns and spots it at her 2 o’clock. More notably, Pumyra is accidentally drawn in her final ThunderCat uniform (red boots, red strap, gold choker) in a scene within Fire Rock Mountain. These mistakes aren’t egregious, but they are bothersome, and perhaps indicative of the animators having put so much energy into Part Three. 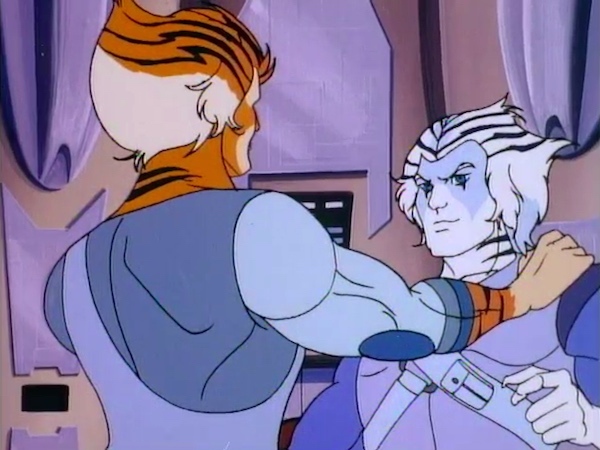 In the end, we get a lovely epilogue that features the Thunderians being praised for their bravery and treated as equals by the ThunderCats, so much so that Lion-O anoints them and Tygra calls Bengali “brother”. This rejection of old world class separation is more than just practicality (i.e. putting everyone under one roof just makes sense). It’s also an echo of what Lynx-O suggests about Claudis. 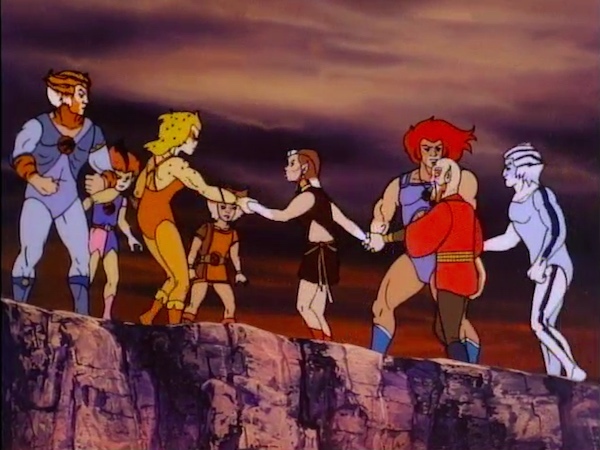 “Everyone knew him,” he says, adding in an omitted line that “although he ruled Thundera, he moved about his people freely, like one of us.” Lion-O continues this populism and carries it one step further by anointing them as equals, foreshadowing egalitarian attitudes that will come into full bloom on New Thundera in “Well of Doubt”. The trauma of abandoning these three people, the nightmare that began this five-parter, had the haunting undertone of Lion-O’s life being more valuable than theirs. Here in Part Five, and eventually on New Thundera, our young Lord seeks to right that wrong. One day, you will have to make many hard decisions, Lion-O. This was an easy one. 1 ^ Leonard Starr gave each part a working title. 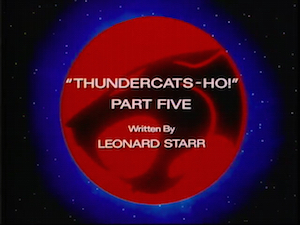 Part Five’s was “The New ThunderCats”. 3 ^ Hachiman being from another time doesn’t quite jibe with what we learn later in “The Jade Dragon”. 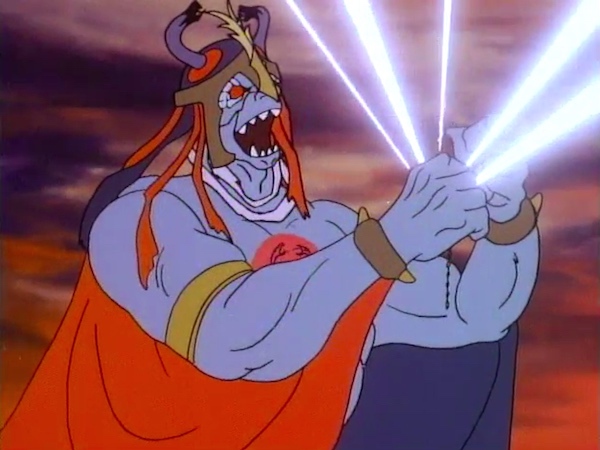 4 ^ Mumm-Ra can see and hear Jaga, just as in “Malcar”. 5 ^ This is the subject of some controversy, as some fans have taken this to mean that the two are actually brothers, and some licensed materials have added to the confusion. 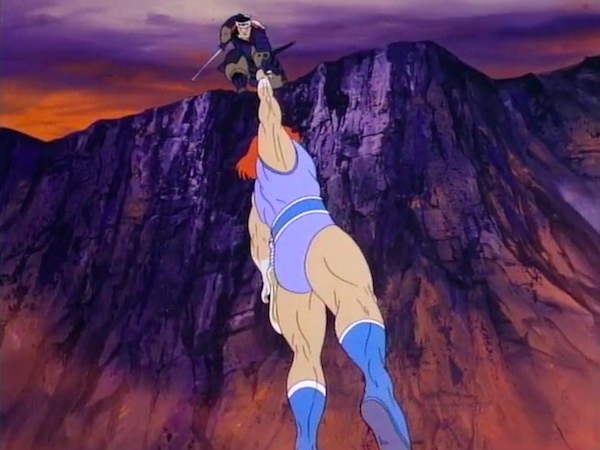 The episode intro features a shot of a pitiful Lion-O hanging onto the bridge that was not present in Part Four. Instead, it’s a single frame from the opening scene of Part Five. In “Together We Stand”, Ram-Bam mentions that the Berserkers had a bath “two months ago.” Perhaps he’s referring to this episode. It’s odd that Tygra recognizes Captain Shiner, since the two never met in “Sword in a Hole”. That Jaga and Grune are flesh during their confrontation suggests that the Star of Thundera exists in the Astral World. It’s not explained how S-S-Slithe and Jackalman emerge from Fire Rock Mountain before the Thunderians, since they were presumably behind them giving chase. Worse, we see them retreat into the prison before it’s destroyed, but they appear alive and unscathed in “Mumm-Ra Lives! Part I”.